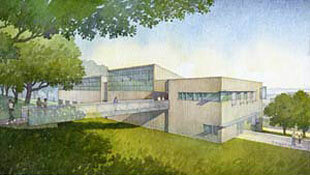 Architectural rendering of the new Digital Arts building. The Arts Division celebrated the groundbreaking of a $25 million Digital Arts building with an event in October. Slated for completion in May 2009, the state-funded facility will be located near the Elena Baskin Visual Arts Center on campus.